Prototype: German Federal Railroad DB class 144 electric locomotive. Ocean Blue ivory paint scheme. Road number 144 021 3. The locomotive looks as it did around 1975. 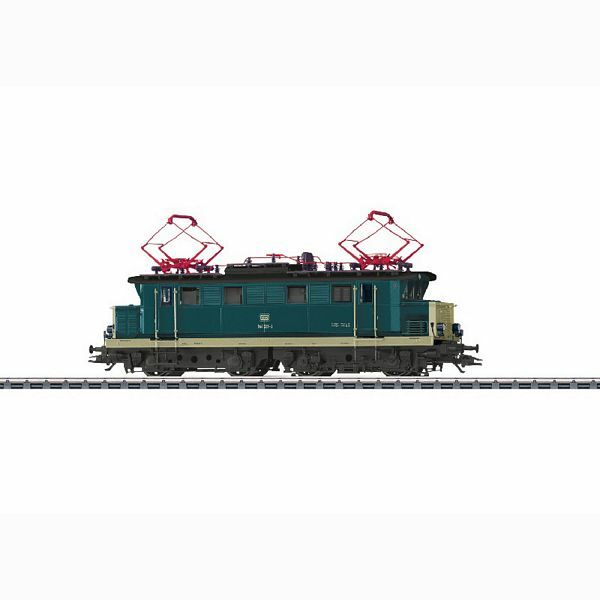 The car set to go with this locomotive can be found in the Marklin H0 assortment under item number 47319. After successful testing and release for service of the E 17 express locomotive in 1928, the next thing on the horizon for the DRG was the creation of a somewhat smaller general-purpose locomotive. As a crude concept the idea was put forward of a B-B unit without pilot trucks. Financial difficulties at the DRG caused by the world economic crisis delayed a concrete award of a contract. At their own risk Siemens, Bergmann, and Maffei-Schwartzkopff each then developed an experimental locomotive in this version. Siemens was able to present its prototype to the industry as early as August of 1930. Among its significant features was a welded girder-built underframe, a mostly welded superstructure, an air-cooled transformer, and axle-hung motors. In 1932, the DRG acquired this unit, put it into the DRG roster as road number E 44 001, and set its maximum speed at 90 km/h / 56 mph due to its good running characteristics. In the meantime regular production based on the prototype of road number E 44 001 had already proceeded. The first group of 20 units in 1933 was followed each year by about 10 to 15 more units and even through the war because the E 44 had proven itself in so many ways that it had been declared a "War Electric Locomotive" (KEL). After experience on Austrian routes with steep grades, the locomotives were equipped starting in 1943 with electric resistance brakes and a raised "W" next to their road number. By the end of the war, road numbers E 44 152W-175W and E 44 178W had been delivered. In Southern Germany 13 units had to be withdrawn from service by the start of 1946 due to heavy war damage. The half-finished road numbers E 44 176W-177W and 180W-183W were completed between the end of 1945 and 1951 and delivered to the DB. At the start of 1953, the DB had 118 E 44 units (starting in 1968: 144, with resistance brakes: 145) in service. Even the new DB paint scheme of ocean blue / beige was applied to two units. Road numbers 144 021 and 071 were repainted this way in 1975. In September of 1983, regular use of the locomotives ended on the DB, and road number 144 081 was withdrawn from service on September 30, 1984. In the Soviet occupied zone, there were 50 E 44 units at the end of the war, some of which were damaged. After forced discontinuance of electric train operations on March 29, 1946 45 units were transferred to the USSR as spoils of war. In 1952, the DR received 44 units back. Electric operations on the DR began again with the E 44 on September 1, 1955. The maintenance facilities in Dessau rebuilt 46 locomotives by 1961 (starting in 1970: class 244). The last four were retired on December 31, 1991. Nineteen units are preserved for museum purposes in the East and West. Only road number E 44 044 is currently still operational as a "maintenance facility locomotive" in Dessau.